During most of the Civil War, Lee shared general popularity with other Confederate generals. In the later part of the war and until his death in 1870, Lee was a hero figure for Virginia. He was called such things as the "First Gentleman of Virginia." His white horse was reportedly half bald by the war's end, from devotees snatching a souvenir as the general passed by. After Lee's death, organizations such as the lee memorial Association, the Ladies' Lee Monument Association, and the Southern Historical Society began to formalize Lee's iconization by being public, by being organized, and by being in print. The act of praising Lee had a therapeutic effect on the Southern psyche. After five years of war and five more years of shame, Lee's death came as the symbolic resurrection of the Southern myth. Perhaps the event that best characterized Lee's standing as the country entered the last decade of the nineteenth century occurred in Richmond in 1890. 100,000 people turned out for the dedication of a towering equestrian statue of lee on Monument Avenue. The Cult of the Lost Cause, with Robert Lee as its demigod, was flourishing. The event was reported with some hostility in a few Northern newspapers, but the eminently mainstream Harper's Magazine opined that Lee personified what was best of a bad cause. The North was slowly was slowly but steadily moving to embrace its former enemy. Just 20 years later, Harper's would call Lee "the pride of the whole country." As the 1870's progressed, invective in the Northern press regarding the South and the War gradually subsided. Meanwhile, Southern men of letters began honing their arguments in retroactive defense of their region. The uncoordinated public relations campaign these writers took part in got a great boost in 1882, as Scribner's, a magazine with a national reputation, changed its editor and its name. When Richard Watson Gilder took over the magazine, renamed The Century Illustrated Monthly Magazine, one of his avowed goals was to focus on the Civil War in what he considered a Lincolnesque spirit of reconciliation One of the first to take advantage of this fair-handed policy was Henry Watterson, editor of the Louisville Courier-Journal, who published "Oddities of Southern Life" in the April, 1882 issue. Though largely a light-hearted collection of anecdotes, the article closes with a paean to the Old South in general, and Southern womanhood in particular. Watterson was followed by Thomas Nelson Page, Joel Chandler Harris, George Washington Cable, and William P. Carter, among others, each of whom romanticized the Old South in his own way in the pages of The Century. Readers' letters from both North and South expressed a great deal of interest in -- and little objection to -- this "new" subject-matter. Southern subjects became so popular that even some Northern authors began to write poems and stories in praise of the Southern belle. The period between 1870 and 1909 was one of unprecedented growth in the economy (due to industrialization) and population (due to immigration). Naturally, along with these massive changes came anxiety and its partner, nostalgia. Americans were fast losing the agricultural, Anglo-Saxon culture that had dominated the country for as long as anyone could remember. The changes were more than just economic and demographic-they were changes in values as well, changes that left people longing for moral stability. In Lee, Dykers uses a biographical structure to reveal the qualities of Lee that are the reasons for ". . . the nation yet unborn / Shall learn to know and love him / Like the fathers that have gone." In this poem Lee is the "center of attraction," "a hero," with "honor pure, unsullied." He is "undaunted," "grander when, disabled," wh an understanding of "duty" and achievement of "respect and fame." Thompson chooses one particular battle in which to set his discussion of Lee in Lee to the Rear. He describes one day of a battle from dawn to dusk, during which the soldiers demonstrate their dedication for their general. In the heat of battle, Lee moves forward to lead his men. They will not permit him to take this active role, endangering himslef, and send him to the rear of the lines where he can direct them from safety. Even while this poem is set in the thick of the war, the timely participants are enforcing Lee's iconic status. He is first introduced as "not much moved" and "[c]alm and resolute." After he is sent to safety, behind the lines, the poet echoes the lines, "Calm and unmoved as in battle he sat, / The grey-bearded man in the black slouched hat." The soldiers and the poet create and maintain their icon by disallowing Lee's vitality. In Robert E. Lee, Howe gives reasons why Lee is an admirable man ("gallant foeman," "brother," "learning"), but ends by solving a dichotomy: "Thought may the minds of men divide, / Love makes the heart of nations one." She says Lee possesses both thought and love. 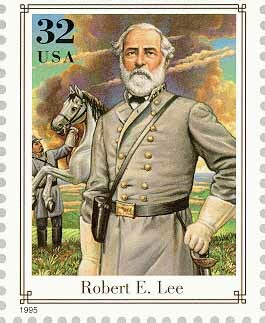 Lee's sword stands for his role in battle, in particular, and his role in American consciousness, in general, in The Sword of Robert E. Lee, but Abram Joseph Ryan. The sword, and Lee, are "pure and bright," "stainless," "shielding thefeeble, smiting the strong, / Guarding the right, avenging the wrong." They are "purer," "braver," "brighter." "Defeated, yet without stain, Proudly and peacefully!" Ryan uses the cues of a scabbarded and unscabbarded sword for the life and death of Lee's career, but not of his meaning in the nation.